Which pair of scissors for sewing? There are mainly scissors for sewing: two kinds of scissors, scissors conventional all-metal type "Nogent" in France or scissors metal blades and ergonomic plastic handles.In these two categories, there is provided a choice of blade lengths that range from 16.5 to 25 cm (see above). The classics are a great value with a more traditional appearance regrindable, those ergonomic handles are adapted to the shape of the hand but are sometimes less accurate cutting of the end (the shape of the tip is coarser than the classic scissors to check when buying.) The cut-son can quickly cut the son at the end of a machine seam. For embroidery, there are small scissors short and thin blades. The pinking shears temporarily help limit fraying or make a decorative finish in tissues that do not fray, but beware these scissors can wear very quickly if they are not of good quality. Can we take all kinds of scissors to cut fabric? Is there any sewing scissors adapted to left-handed person? What size to choose for scissors? There are different lengths of scissors, those who are very long are reserved for professionals who need long blades to quickly cut long lengths of fabric, but they are heavy and tiring to handle. Which scissors to any activity (embroidery, sewing, knitting)? For sewing, you need a pair of scissors average length will only cut the fabric with pointed ends (for greater cutting accuracy), a pair of scissors will only cut paper (for employers) and a pair of embroidery scissors for all small delicate and precise cuts (make a buttonhole, pinking etc. ..). When you sew much to the sewing machine, it is also useful to have a wire cutter. 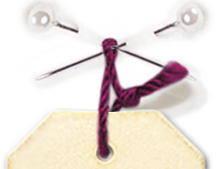 For embroidery, embroidery scissors is essential and it is also used for knitting and crochet. What are indispensable scissors when you start? A pair of scissors for fabric, scissors and paper scissors embroidery, yes, I know, it's three pairs of scissors to buy! How can my scissors cut over time? Still well in time there is a rule of thumb: the fabric scissors cut the fabric and paper scissors cut the paperdo. In fact, the paper is very abrasive blades of scissors, so if you discipline yourself not to follow this rule, "fabric" scissors cut paper will also not intersect anything good! But do not worry, nothing is irreversible, if you have a pair of "classic" scissors you can make sharpening (that is anyway an operation to do make time to time to maintain his scissors.) It was a trade in endangered but thanks to the internet fairy, there are now grinders mail . For scissors plastic handles, there are small individual sharpeners that can refresh yourself its blades. Lately appeared on the Japanese market scissors blades with an exceptional quality of cut, which even allow you to cut both fabric and paper, as professionals we use the paper pattern fusible and this allows us to cut both fabric and boss when the boss was stuck on the fabric.